We come on a ship that sailed the moon. . .
Flags were an afterthought at NASA. Even as the “space race” launched the Cold War into orbit, flags threatened to cheapen the adventure. Soviet Vostok rockets did not display hammer and sickle. America’s Mercury capsules had just a small flag stamped on dark metal. 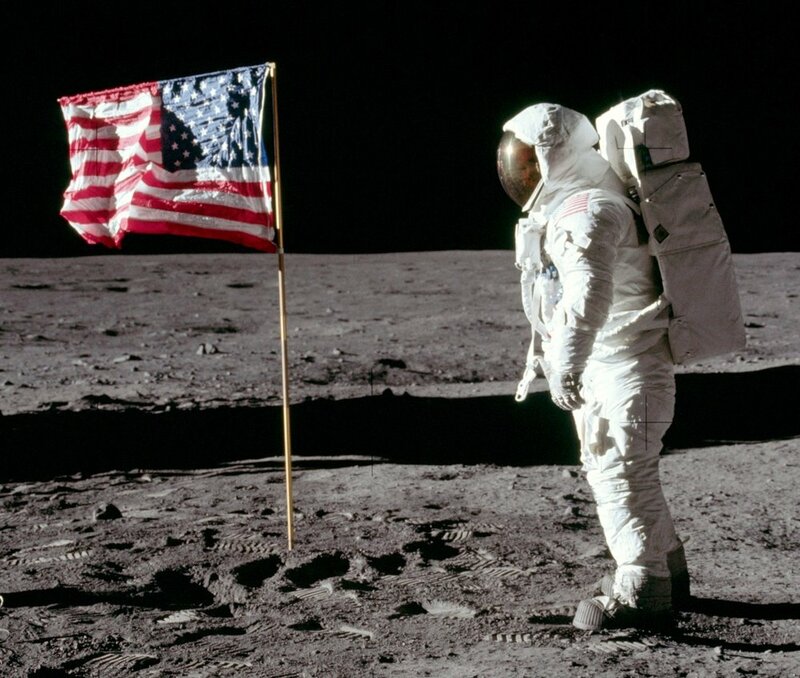 “There was certainly no practical reason to slap Old Glory on an astronaut’s shoulder,” Buzz Aldrin recalled. “After all, there were no customs posts out there.” But then — the moon. July 20, 1969 — Towards 11:00 p.m. Eastern Daylight Time, Neil Armstrong takes his “small step.” Moments later, Aldrin follows. While a billion TV viewers watch in wonder, the astronauts explore the moon. They bounce like balloons. They stuff rocks in a pouch. They unveil a plaque, Armstrong reading it aloud — “We came in peace for all mankind.” And then it’s time for the flag. But this would not be the first flag on the moon. Back in 1959, Soviet scientists stuffed a flag in a rocket and launched it. When it hit the target, there was the flag of the USSR, sort of on the moon. Despite the stunt, NASA officials balked at planting the stars and stripes on the Sea of Tranquility. A 1967 Outer Space Treaty declared the universe, beyond our pale blue dot, as neutral turf. NASA hesitated to give the impression “that the U.S. had taken possession of the moon.” Debate continued. Finally, it was decided that the “We came in peace” plaque might dilute any jingoism. A flag, yes, but how? NASA loved acronyms. The Lunar Excursion Module was the LEM. Trans-lunar Injection was TLI. So the flag became LFA — Lunar Flag Assembly. An engineer in Houston, recalling his mother’s curtain rods, took a $5 government surplus flag and sewed a seam along the top. He fixed two aluminum poles, one to plant, one to telescope at a right angle. The LFA was stored on one leg of the LEM in a box insulated to withstand 2,000 degrees at takeoff. 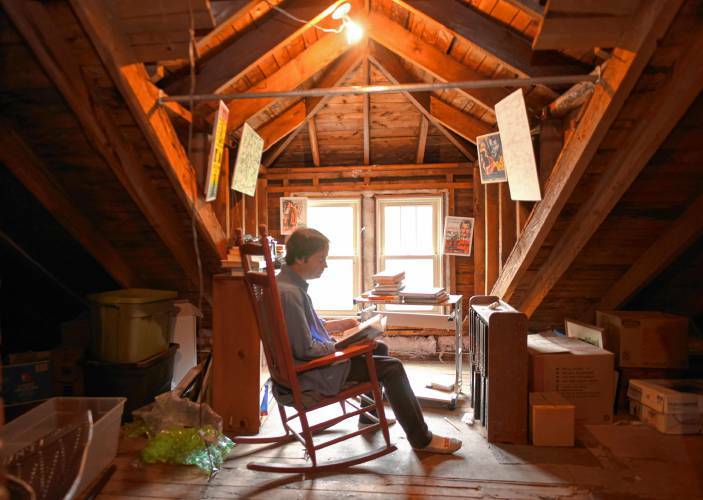 Neil and Buzz would just unpack and set it up. Not exactly, um. . . rocket science. Neil Armstrong had made a hundred-plus landings on aircraft carriers. He flew the supersonic X-15 to the dark edge of the atmosphere. His quick maneuver saved Gemini VIII when the capsule began gyrating end over end. And he had piloted the Eagle to the lunar surface, taking manual control, flying over boulders, and setting it down with 20 seconds of fuel left. “I don’t think anyone could touch his skills,” Aldrin remembered. Buzz Aldrin flew 66 missions in Korea. On Gemini XII, he floated for five hours in space. He had Ph.D. from M.I.T. and an obsession with docking that earned him the nickname “Dr. Rendezvous.” Both men practiced every maneuver they would perform on the moon. Except planting a flag. The pole was easy, but the telescoping rod jammed. Stuck. Stuck. Still stuck. Neither astronaut said, “Houston, we have a problem.” They had no pliers and had forgotten the WD-40. So they let the flag wrinkle in what Aldrin called “a unique permanent wave.” Now to plant it. Dust that reminded them of gunpowder soiled their space suits, but an inch beneath the dust was hard rock. They jammed the pole in. Jammed again. “It didn’t look very sturdy,” Aldrin thought. What if the American flag, planted proudly, keeled over while the whole world was watching? Finally, it seemed sturdy enough. Aldrin gave “a crisp West Point salute.” Armstrong snapped a photo. They were about to change roles when they got a call from the president. They never took another picture of the flag. Hours later, when they blasted off, their exhaust blew the flag into the dust. Five more American flags were planted on the moon. The fate of the first led astronauts to set each farther from lunar modules. But the moon, as science fiction writer Robert Heinlein wrote, “is a harsh mistress.” Temperatures top 200 degrees in sun, plunge to -220 in darkness. Intense UV radiation batters the airless surface. NASA, where flags were an afterthought, never considered their long-term survival. And yet. . . In 2011, NASA’s Lunar Reconnaissance Orbiter photographed Apollo landing sites. There in the Sea of Tranquility, the Ocean of Storms, the Descartes Highlands were the shadows of each LEM. 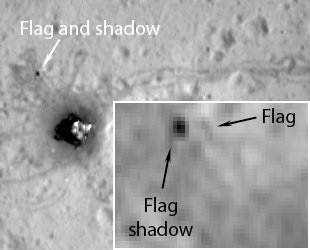 And in three sites, from Apollo 12, 16, and 17, there was the shadow of a flag, still standing.